It’s been a rough start to the new year and it is just a few hours old! Today’s late post still wishes you a happy new year! 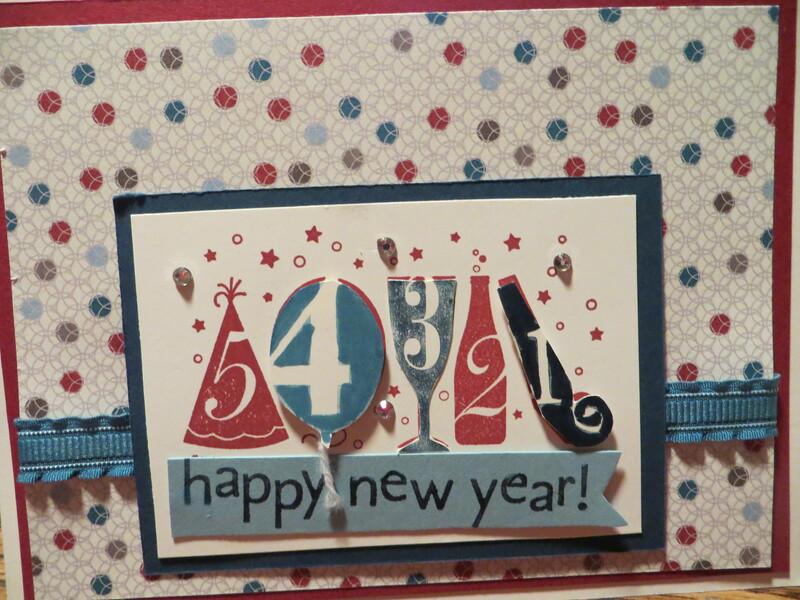 I love this card I made to bring in the new year. It just screams for a fancy celebration. The masquerade mask is made using the now retired Stampin Up mustache framelit and the Chalk Talk Framelits #129983 for the eye holes. I used the new coming soon blushing bride and the dazzling diamonds Glimmer paper to cut the festive feathers using the now retired Four Feathers Framelits. I added a bow using the Silver metallic thread #138402. The happy is cut using the Hello You Thinlits die #137363. 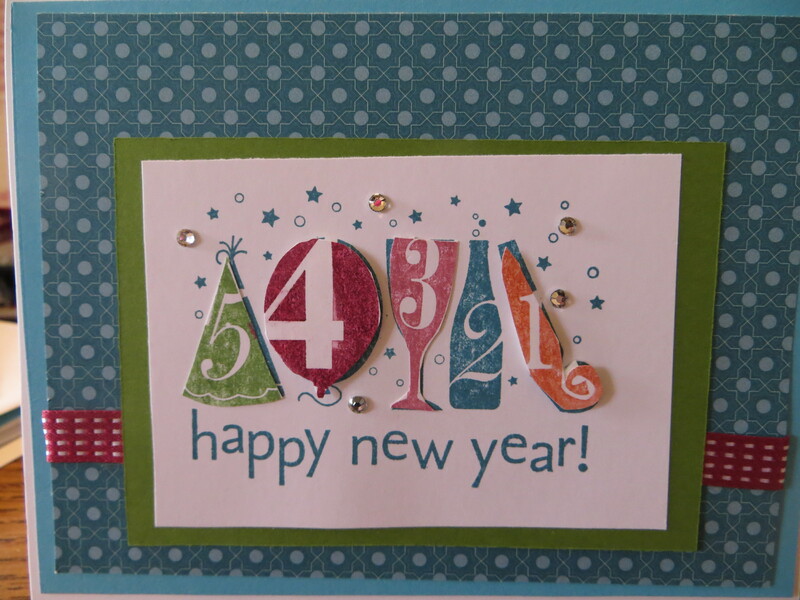 The new year sentiment is from retired Good Greetings stampset. I added some randon colored sequins from my stash add just enough bling for a festive new year. Happy New Year’s from 3 sisters 2 stamp. This is a sneak peek at the real chalkboard paper coming soon in the 2015 Stampin Up occasions catalog. I used the Mingle All the Way stamp set from the Stampin Up Holiday catalog. The Stampin Up Holiday catalog is available thru January 5th. 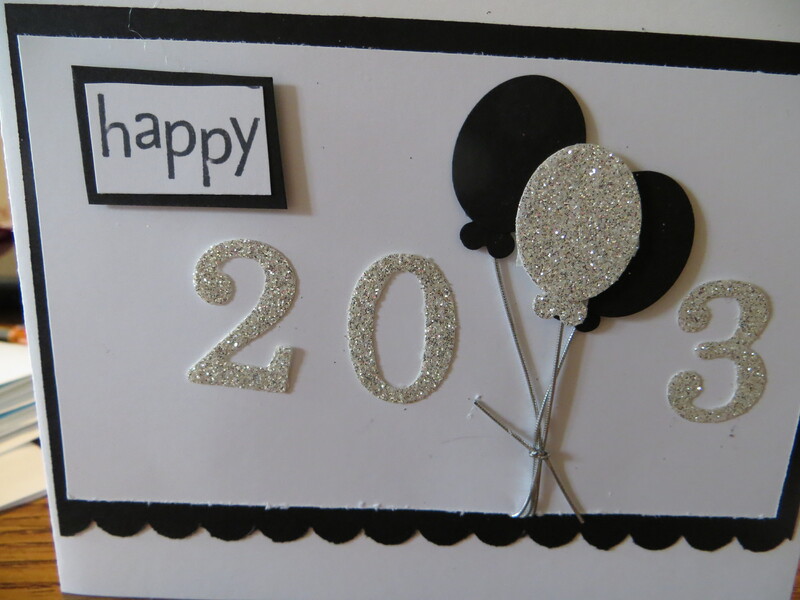 2014 was a good year with a lot of changes but looking forward to sharing the love of card making and creativity in 2015. Happy New Year’s eve one and all. Today’s post features the Mingle All the Way #135773 stamp set paired with the Trim the Tree Designer Series Paper Pack #135824 from the Stampin Up Holiday catalog. Happy New Year! I swore I was not going to make New Years cards this year but I could not help myself. I was clearing off my table and ran across the Embellished Events #126497 stampset and decided I would make a few cards. 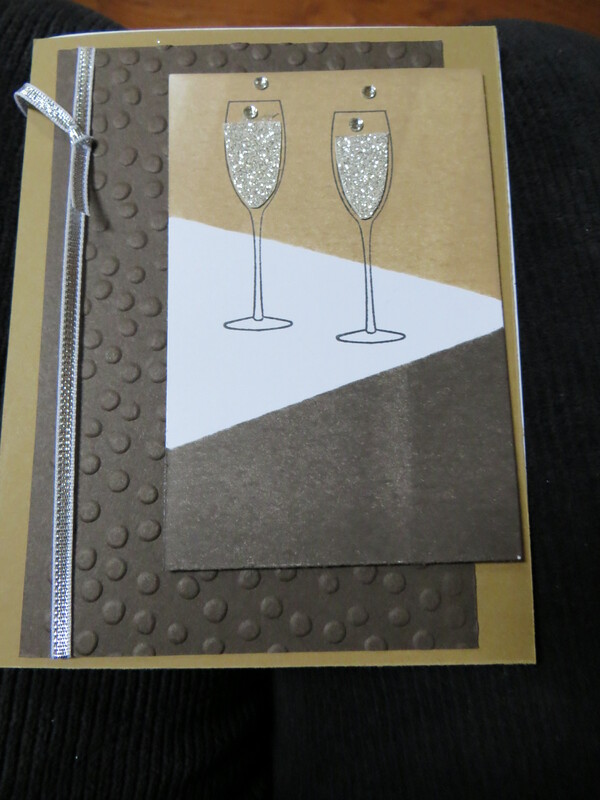 I used brown sugar and early espresso inks and cardstock for this card layout. I stamped the champagne glasses on the table and then I stamped them again on the Stampin Up silver glimmer paper. I cut out just the liquid part and glued it inside the stamped glass and added some bling bubbles. 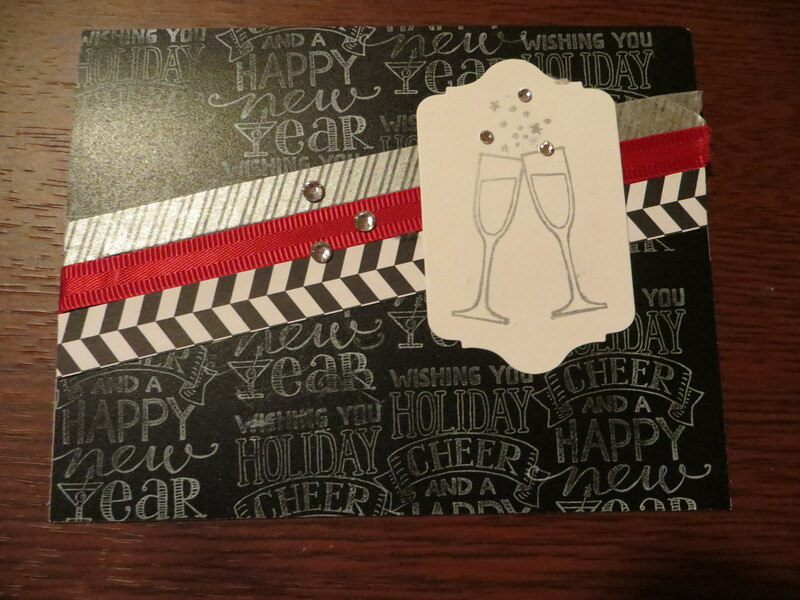 I finished the card with the silver 1/8 inch ribbon. No explanation needed for this card it simply says it all! Happy 2013 one and all.